Services & Solutions « Security Door Specialist, Inc. Here at Security Door Specialist, we supply and install commercial doors, frames and hardware that are customized to fit your business aesthetic. Our many projects have included hospitals, schools & universities, office spaces, hotels, churches, retail and restaurants. Whether your opening is partially existing or entirely new, we are here to satisfy your commercial and industrial door, frame and hardware needs with our experienced installation team. At Security Door, no job is considered too small or too large. Contact us today to set up a free and complete on-site estimate. 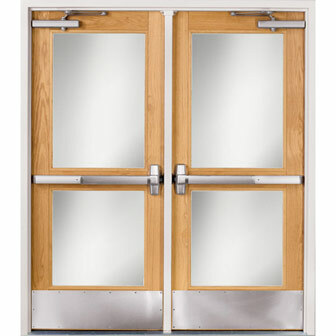 Whether you are having trouble with the operation of an existing opening or you simply just want to change the locks, we are here to satisfy your commercial and industrial door, frame and hardware needs with our fast and reliable service and repair. If an emergency service and repair is needed, Security Door is able to attend to you the same day you place the call. Contact us today with any service and repair calls that you may have. Whether you are a general contractor or an employee directly working at the place of work, our inside sales team is always willing and excited to assist you in your company's next project. At Security Door, we strive in our everyday reasonable pricing and customer satisfaction. Contact us today to discuss any present or future projects you are working on or are bidding on. Whether you need some insight and ideas or you are following approved construction drawings and specifications, we are here to help assist you and guide you in completing and satisfying your project's requirements. At Security Door, we prepare orderly and informative submittals to our customers in a timely manner and are able to provide you, if needed, wood door samples from our manufacturers in various sized veneers and finishes.